Hoof Secret is a small, alfalfa-based pellet that combines the key ingredients Biotin, Zinc and Methionine to support optimal hoof growth. Biotin is best known for healthy hoof growth, Zinc strengthens the bond between the soft tissue of the inner hoof to the outside hoof wall and Methionine is a sulfur containing amino acid required for hoof growth. B-Vitamins are also imperative for healthy skin, coat and hoof growth. 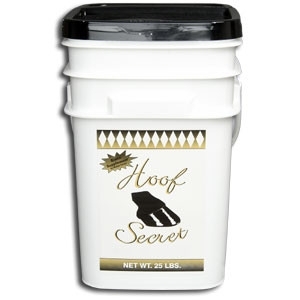 Feeding Hoof Secret will improve hoof hardness, hoof thickness and improve tender feet while promoting new hoof growth. Each ounce of Hoof Secret delivers 35 mg. Biotin, 2286 mg. DL-Methionine, 138 mg. Zinc, 43 mg. Manganese, 10 mg. Vitamin B6 and 328 mg. Ascorbic Acid.